Пора летнего цветения была наиболее разработанным и самым любимым мотивом в творчестве Шишкина. Этот рождающий чувство умиротворенности пейзаж был написан в самый плодотворный период творчества мастера, когда все ощутимее становится его стремление к большей живописной свободе. lvan Shishkin always sought a detailed narrative in his landscapes. The thick grass, supple trunks, dense foliage penetrated by the sunlight and the sunlit meadow in the depths evoke a joyous air and a sense of the power of nature. This general mood is intensified by the figures of the peasant women walking along the stream in search of mushrooms. The period of summer blossom was the most developed and popular motif in the art of lvan Shishkin. This optimistic work links ideas of the abundance of nature to the concepts of human happiness and contentment. 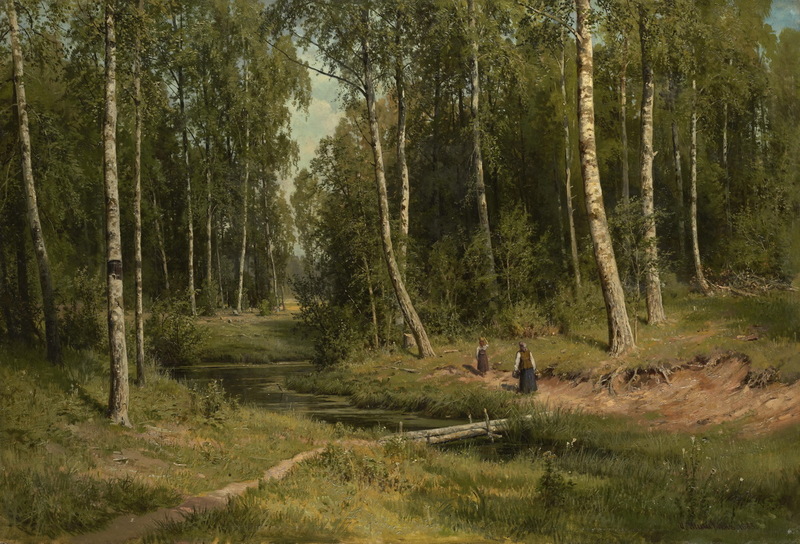 Brook in a Birch Forest was painted in the most prolific period of the master’s oeuvre, when he was increasingly aspiring towards greater painterly freedom.